"Given our views on credit contraction in Asia, and in China in particular, let's say they are going to go through a banking loss cycle like we went through during the Great Financial Crisis, there's one thing that is going to happen: China is going to have to dramatically devalue its currency.... "We are not short Chinese equities, but we are very invested in the Chinese currency: we think we are going to see a pretty material devaluation; we think it's going to be in the next 12-18 months." He did not specify exactly what he means by "pretty material devaluation" however according to our own December calculations, an indicative number is likely in the 10-15% ballpark. Today, another Texas-based hedge fund manager who just like Kyle Bass correctly predicted, and profited from, the subprime crisis, Corriente Advisors' Mark Hart, has not only reiterated Kyle Bass CNY devaluation call, but has gone as far as quantifying by how much the Chinese currency will have to fall. Cited by Bloomberg, Hart has said that "China should weaken its currency by more than 50 percent this year." Instead, a one-off devaluation would allow policy makers to “draw a line in the sand” at a more appropriate level for the yuan, easing pressure on China’s foreign-exchange reserves and removing an incentive for capital outflows, according to Hart, who’s been betting against the currency since at least 2011. He adds that China should devalue before its $3.3 trillion hoard of reserves shrinks much further, he said,because the country can still convince markets it’s acting from a position of strength. Incidentally, this is precisely what Ex-PBOC adviser Yi Yongding says yesterday China should do, as quoted by the 21st Century Herald, adding that the PBOC’s forex reform in Aug. 2015, known as “crawling peg” by foreign investment banks, has many flaws and should be abandoned. Accoding to Yi, the scheme won’t be able to break mid- or long-term depreciation expectations because those are decided by fundamentals, even if they are misinterpreted. His conclusion is a widely accepted one by now, namely that China may not have better choice but to strengthen control over capital flows to stabilize financial market. Back to Hart who says that "there wouldn’t be anything underhanded about a sharp devaluation. 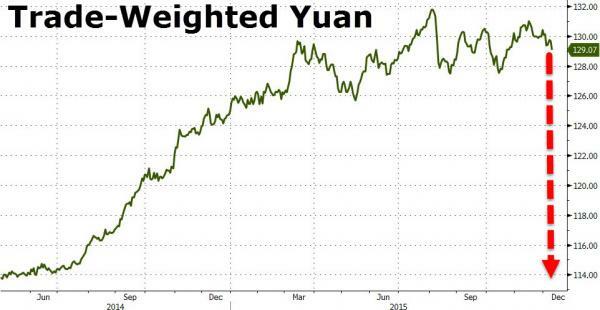 Why should China be forced to suffer deflationary effects of defending its currency when everyone else isn’t?" In other words, why peel the bandaid one millimeter at a time when China should just rip it off in one motion? Here's a reason why: or rather over 20 trillion reasons, which is how much in dollar equivalent deposits Chinese savers have parker at their local banks. If those depositors realize that their net purchasing power for foreign goods and services has suddenly lost 50%, in the words case, there would be riots in China, and in the best case an unprecedented capital outflow. Which is also why China has been so unwilling to do the "bandaid" approach. As Bloomberg adds, Hart, whose prescription clashes with consensus forecasts for the yuan and recent comments from senior government officials, said China would be justified in weakening the currency after central banks in Europe and Japan fueled declines in their exchange rates to stoke economic growth in recent years. Such a move would likely come as a surprise to global investors, who were rattled by a drop of less than 3 percent in the yuan last August. While a one-off drop in the yuan could ease selling pressure on the currency and support exports, it would also entail risks for China and the rest of the world. Chinese borrowers have amassed $1.5 trillion of foreign-currency debt, according to an official estimate at the end of September, which would become instantly harder to repay after a sharp decline in the yuan. 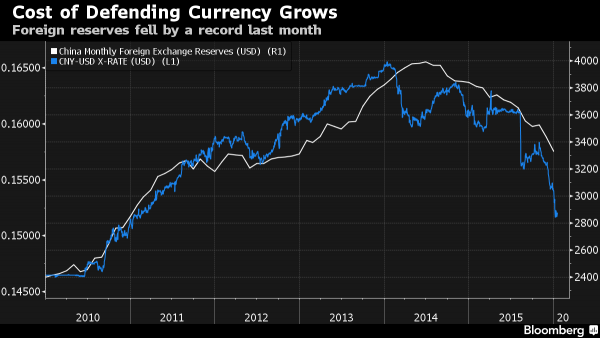 A devaluation could also fan fears of a global currency war -- a risk that Mexico’s finance minister cited earlier this month -- and spur the U.S. Federal Reserve to backtrack on plans to raise interest rates, according to Hart. For now, Chinese policy makers have signaled there are no plans for a big drop in the yuan. Premier Li Keqiang on Friday pledged a “stable” exchange rate and said the nation has no intention of stimulating exports through a competitive devaluation. Bets against the currency will fail and calls for a large depreciation are “ridiculous” as policy makers are determined to ensure stability, Han Jun, the deputy director of China’s office of the central leading group for financial and economic affairs, said last week in New York. However, while in August 2015 China did engage a modest one-off devaluation, there is a precedent for a far sharper devaluation. The currency slid 33 percent at the start of 1994 as authorities unified official and market exchange rates, and the yuan has stayed stronger than that level ever since March of that year. That decision was a “wild success,” helping to set the stage for years of economic growth and foreign-exchange inflows, said Hart, who founded his hedge fund in 2001. While a devaluation this year would be “jarring” and may initially accelerate capital outflows, it would ultimately put China in a stronger position, according to Hart. He said the country could explain the move by saying it would put the yuan at a level more reflective of market forces and allow the currency to catch up with declines in international peers. It would also most likely unleash another global currency crisis, first among the Emerging Nations, and then among their Developed peers, as country after country scrambled to implement comparable currency destruction as China, in order to preserve their relative share in dwindling global trade, where the shortest way to boost one's exports has over the past 7 years, been a very simple one: destroy your currency faster than your exporting competitors. The reality, however, is that Hart is correct, and China will have to pick one option: either a sharp devaluation, or failing that, debt defaults: the current course of gradual CNY debasement will only results in an acceleration in capital outflows until ultimately China's $3 trillion rainy day fund is whittled away to nothing (and as a reminder, according to some estimate just a little over $1 trillion in it is actually liquid assets). Hart is not alone in predicting a massive Yuan devaluation: Carlyle Group’s Emerging Sovereign Group in New York and Omni Partners in London are also positioned for a retreat in the currency. Crispin Odey, who runs Odey Asset Management, said in September that the yuan should fall by at least 30 percent. Finally, this is how Hart is trading the upcoming devaluation: Hart said he’s wagering against the currency with put options, contracts that provide the right to sell at a specific price within a set period. Bets on a sharp devaluation aren’t common among his hedge fund peers, who only recently started to wager on a gradual depreciation, Hart said. Which is 100% correct, and is also why the market is finally starting to pay attention to the China in the bull store, after years of stubbornly ignoring it.